10' Wide x 10' Long x 10' High. object of the game seems simple enough, knock down some target balls. Easier said than done however, what makes this game so tricky is that the target balls are spinning and dancing around in mid air. The balls actually hover in an upward air stream and move around. The multi sport game has you kicking soccer balls and throwing footballs. end of the event you simply pop the balloons and collapse the ball skins. The entire unit is designed for portability, ease of set-up/use & entertainment value. 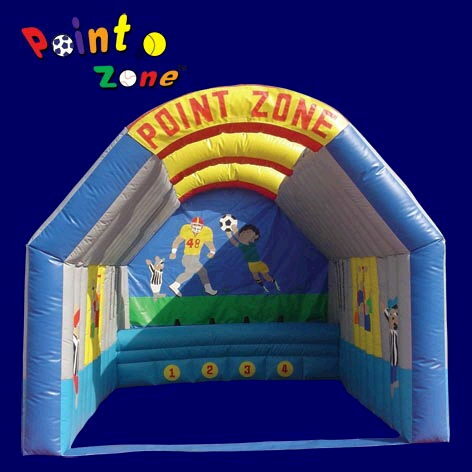 * Please call us for any questions on our penalty kick/point zone rentals in Pipersville PA, Hatfield PA, and Bucks & Montgomery Counties in Pennsylvania.